The DM-143 offers professional-grade digital stereoscopic imaging - with an impressive features package - at an affordable price. With this versatile microscope, you can effortlessly capture hi-res digital video and still images thanks to its built-in 3.0 megapixel camera. An easy-to-use computer interface allows users to not only capture superior images, but also to measure, inspect and manage every aspect of the image gathering process. This microscope is simple to operate, making it the perfect tool on quality control/ production lines, in the lab, in the classroom, or anywhere that a quality digital microscope would prove helpful. The built-in camera outputs high-quality 2048x1536 live imaging, which treats users to crisp, clear, detailed color images on your computers monitor, with zero hassle. With this powerful Motic Images Plus package, the user is able to take still image snapshots, perform rapid live image capture, written annotation, advanced linear and geometric measuring, voiceover capability and a wide array of additional imaging enhancement capabilities. The DM-143's design provides ultimate flexibility in how the microscope is used, allowing a wide range of specimen sizes to be viewed. 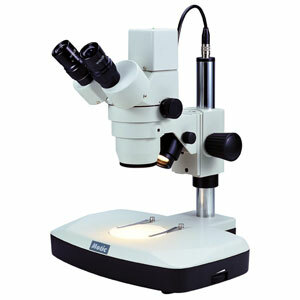 The camera is not necessary for this microscope to be used as a fully functional, stand-alone microscope. Although, when it is used with its digital camera capabilities, the DM-143 allows users to share its vivid still and video images with co-workers, clients and/or students. The microscope also has a built-in incident (top) and transmitted (bottom) halogen illumination 12V/10W with intensity control and a compact column stand with a wide, stable base which allows it to be placed virtually anywhere.